Every so often (but less and less frequently as time goes by), I come across music that is truly Earth-shattering. Music so unique, so powerful, so brilliant that as I listen, I feel like time has stopped, and I have entered another dimension. This happened recently when I discovered a band from Australia called Ne Obliviscaris. Formed in 2003, Ne Obliviscaris (Latin for “lest we forget” or “forget not”) incorporates influences as varied as death and black metal, flamenco, and jazz. Their line-up includes the dual guitars of Matt Klavins and Benjamin Baret, the harsh vocals of Xenoyr, and the dynamic drumming of Dan Presland – all elements which are the bread and butter of extreme metal. But it also includes the clean vocals and violin playing of Tim Charles, and the endlessly creative bass lines of Cygnus, né Brendan Brown. It would be easy for the average bassist to become a mere footnote in a band like this. The sheer intensity and complexity of the music, and the strong musical personalities involved turn the idea of fulfilling the bass role convincingly into an overwhelming proposition. To say that Cygnus more than holds his own in such a challenging setting would be a huge understatement. Instead of laying back and playing basic root notes to anchor the swirling kaleidoscopes of sound, he jumps right in, delivering nuanced, elaborate lines that are so well-crafted that they could almost stand as musical works of their own. I haven’t had the pleasure of witnessing Ne Obliviscaris live, as they haven’t toured in the United States yet. Perhaps if more people over here become fans and supporters, we’ll be fortunate enough to receive a visit from them. In the meantime, I hope you enjoy the interview, and more importantly, their music. It’s no secret that your real name is Brendan Brown. Where did the moniker of Cygnus come from and why? When Ne Obliviscaris were flourishing, we were young and adventurous and there was a point in time we decided we should have stage names such as bands we aspired to like Dimmu Borgir (Shagrath, Vortex etc.) I chose the name Cygnus from an Alarum song (amazing jazz-metal band from Australia). A dear friend of mine who is the ex-guitarist in the band wrote a song on their Eventuality record called Cygnus X-1. The name seemed fitting for two reasons: my love for astronomy and cosmology and that it is one of the most beautiful songs I have ever heard. NeO dropped the use of using stage names shortly thereafter, but I kept mine as a musical alias, as I wish to release my own bass solo music and simply label it Cygnus. 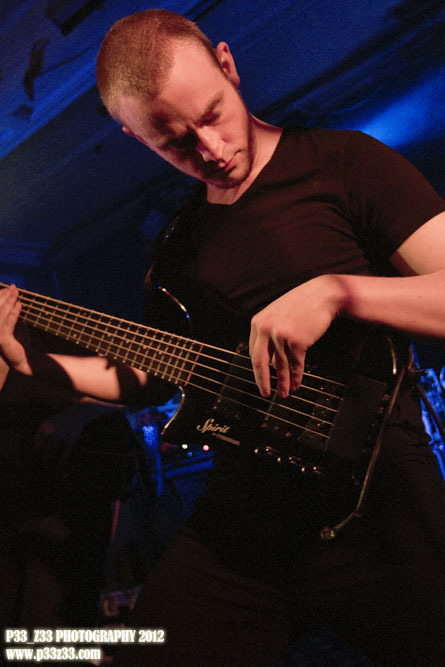 Guitarist Matt Klavins said this about you in an interview: “Brendan had once told me that he used to play simple bass lines and then one day everything just clicked and he understood the bass.” Can you elaborate on that? Well, music is all patterns. I don’t know a great deal of theory, just some basic principles: Minor and major arpeggios and scales. The compositions in NeO are very chordal based. So if the guitarist is playing an E minor chord (which we often do) I realized that I can play the entire E minor scale over that chord and anything I construct will work musically. It’s when I came to that simple realization that a fundamental group of notes can be used to create a pleasant melody over the most basic of chords. Music then became so much easier to express. So a lot of my bass lines incorporate scale runs, high melodies (above the 12th fret) and lots of octave funk/groove work. I always wanted to be a drummer but my mum wouldn’t allow that because of the noise, so she bought me my first bass when I was 14. The rest is history and finger callouses. 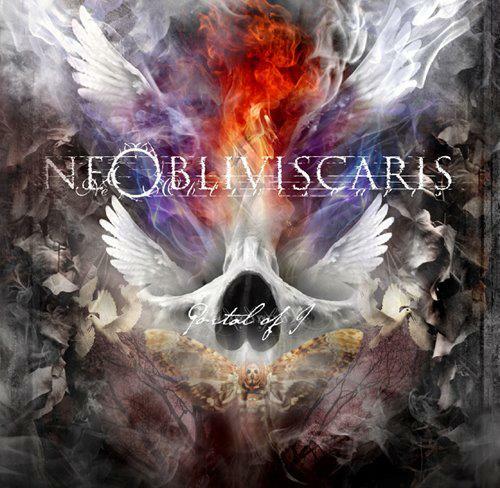 The music of Ne Obliviscaris seems to be orchestrated to the last note. Am I correct, or is there any wiggle room on live shows for any of you to alter your parts at least slightly? The band’s bio says you incorporate influences “from progressive to black, thrash, death and melodic metal, and even western art music, jazz and flamenco.” Can you name any specific artists that stand out for you and your bandmates as important influences? We all have very different musical backgrounds, but we all clearly share a love for extreme Metal! There is no argument there. Tim [violin/clean vocals] has a strict classical upbringing, but he listens to absolutely everything. He is probably the most open-minded out of all of us. He even appreciates some pop, which is something the other guys don’t feel so strongly about! Xenoyr [harsh vocals] listens to predominately black metal and I grew up with a brutal death metal background. My heart lies with death metal, I listen to it every day. I love all styles of music; as long as it conveys emotion I will like it. I can tell in 30 seconds if I like a band or not. I love nonmetal bands such as Sigur Ros, Lamb, Bjork, Aesop Rock, The Gregorian Brothers and Portishead. The list is endless. I know Benji [guitar] has a strong love for flamenco and traditional Gypsy music and bands such as Death and Psycroptic. All these elements and influences are absorbed into the entity that is Ne Obliviscaris. Bands that have influenced us would be Opeth, Emperor, Immortal, Satyricon, and Disillusion to name a few, but our music collections are quite extensive. Clearly, the band’s music transcends the standard structures of verse/chorus/bridge. Where did the impulse to write such expansive musical pieces come from, and what is the songwriting process like? It can be challenging at times. We don’t intend to write such lengthy songs, but once we all have our input the musical journey always seems to be around 10 minutes in length. Often a member will come up with some riffs or bulk of a song in their own time and bring it into the rehearsal room and we all jam it out and discuss repetitions, solos, who takes turns, whether the vibe feels like harsh vocals or clean vocals or even both! It’s a long process most of the time because there are six entities that all have different opinions and may not all agree on the same thing. There have been times where five members loved a part but one did not, we don’t take majority vote, so the part was changed until all six members are happy. It always works out for the best in the end. We transcribe our songs in Guitar Pro so they are easy for each member to learn and add their parts. I find it a useful tool to create interesting bass lines because I have a terrible memory and I need to write down everything. If something isn’t working I can simply delete and start again. Most of my bass lines come from spontaneity and just playing in the moment. There are infinite possibilities. You have to tap into the right one. Let your heart guide you, and write it down as you’re going. 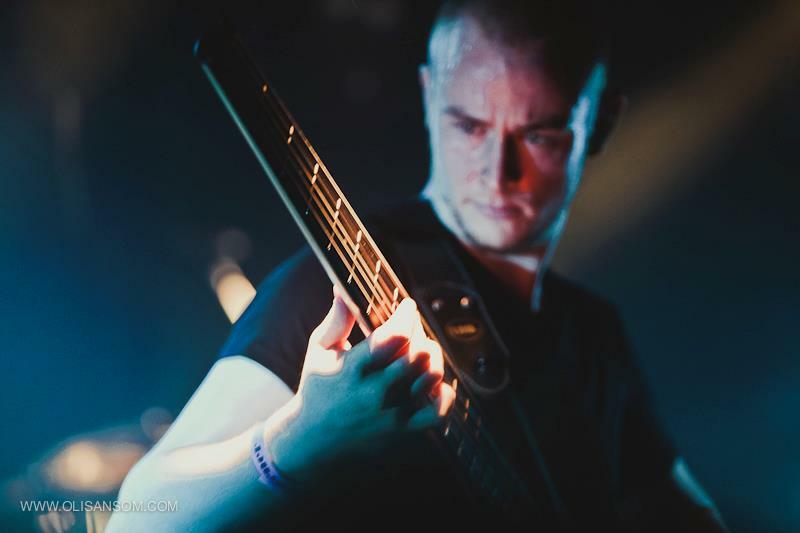 On a band with two guitars, two voices, a violin, and a drummer playing such complex compositions, most would expect the bassist to play very simple parts, yet that’s not the case in Ne Obliviscaris. On the quieter passages, you’re playing a very contrapuntal role, but even on most of the heavier passages, you often do not mimic the guitars, but rather remain in that contrapuntal mindset. In my opinion, the fact that you don’t “dumb it down” when the music gets really heavy gives the somewhat abrupt changes continuity. What are your thoughts on this, and how did that approach come about? I guess it’s just my style. I may have a bad memory but I have a chaotic mind! I like busy complex things. My mind is always racing and everything I do in life has some form of complexity about it. When I first picked up the bass all I did was play as fast as I could. It was sloppy, it was chromatic, I had no idea what I was doing but I knew I wanted to make fast, aggressive music. So I did that for years. Over time, I became more mature and my active mind started slowing down and I began to understand melody and holding back on the bass. I am self-taught and I learned some basic theory, minor and major scales and arpeggios. It opened up a massive doorway. I have always played in death bands where I just follow the guitars note for note. NeO allows me to explore the bass and I love it. Playing with NeO is the best feeling on Earth, and I love how challenging each song can be. The band goes from the quietest whispers to aggressive blast beats, which are used rather often in your songs. Who in the band is the most into extreme metal, or do you all have relatively similar influences? We all listen to similar bands and are very open minded individuals but we all have genres which we learn towards more. I for one have a huge passion for brutal death metal, where as our vocalist Xen leans towards raw black metal. But we all listen to similar bands such as Cynic, Emperor, Katatonia, and Opeth – the list goes on. We regularly show each other bands we have discovered. A band some of the guys are into lately is called Thank You Scientist. They are far from metal. They can be described as technical groovy funk. They also have a violinist and are phenomenal players. I can’t get enough! Describe your gear, and please elaborate on your preference for headless bass guitars. At the moment I use the Eden Navigator WP100 World Tour Class Bass Preamp, Matrix 800 Power amp, Fractal Axe FX Ultra guitar Preamp, Furman PL-8CE Power Conditioner all inside one rack (so I don’t have a separate unit for guitar and bass, I keep it all together for convenience.) I run it through an Eden XST 4OHM cab for bass or a Mesa 4×12 cab for guitar. I prefer headless instruments. I like the visual aspect of it. I feel it gives you a creative edge and something to be remembered by. I could not tell you the amount of times I hear people say “Oh you’re that guy that plays the headless bass.” I was first introduced to Steinberger guitars by Alarum guitarist Mark Evans. Not only is he one of the best guitarists in Australia, but having this guitar just made him rise above the rest. It was something I could not get out of my mind since I was 16 and first saw them perform their incredible metal-jazz fusion. I bought a Steinberger bass and recorded the demo and album with that. Now I use a custom made Status m2 headless mahogany bass with gold hardware and a graphite neck. It’s my dream instrument and I could not play any other bass. I have 9 guitars and basses of different varieties. 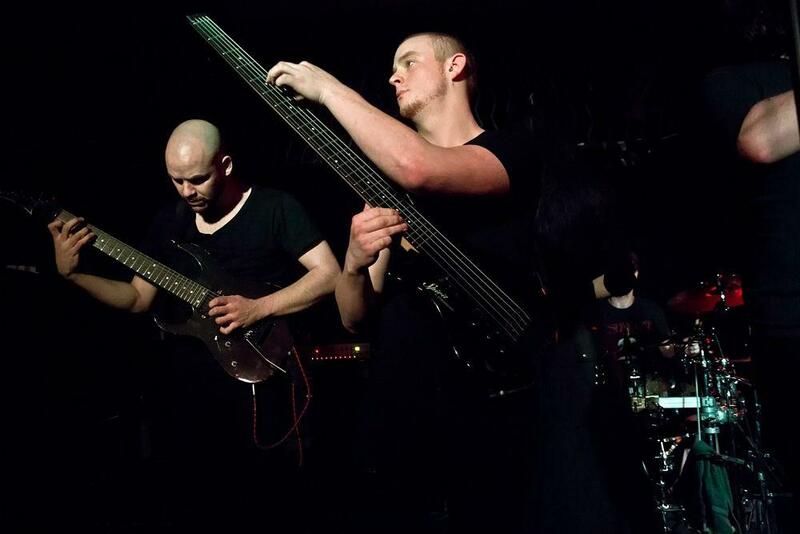 Two 8 string Agile guitars and a 5 string custom Belman fretless bass to name a few. I hear you doing chords sometimes, and tapping. How do you pick your spots? Do you gravitate towards certain chord shapes or voicings? That would all come from the heart. A good musician must know when to not overplay. When I am shown a riff I learn the root notes to get my positioning on the fret board and from there I hear piano-like melodies that enhance the melodies that are already present. I just play these lines on the bass, if there is something that isn’t working we will communicate it, but it is rare as we all trust each other’s judgment. Obviously I would not do a bass solo under a violin solo, so I will hold back and keep it direct and interesting until the time is right. Generally I find bassists that play very simple bass lines are just musicians that aren’t very skilled or creative. It’s not that the part always requires one simple long drawn out root note; it’s that they can’t think of anything else to play or they’re just following the basic root of the guitar chord which does not enhance the music at all. It’s a shame because there is unlimited potential there and I don’t believe the bass is there to be a simple backseat instrument. In old Funk and R&B music the bass often takes the forefront with quite complex, chromatic walking bass lines, dead notes and running arpeggios and extremely interesting pulses. I draw a lot of inspiration from those players even though I don’t necessarily like those genres. I believe that the best use of bass I have ever heard is Spiral Architect’s A Sceptic’s Universe, and Cynic’s Focus. They are by far my biggest inspirations and still to this day I cannot understand how they came up with those bass lines. They inspire me daily and forever will. On one of the videos in which you appear doing bass tracks at the studio, your bass is shown to have a curious pin attached to the strap. It’s a guitar pick crossed out, as if to say ‘No picks allowed.’ Is that just purely in jest, or do you in fact feel very strongly against using a pick to play bass? On an interview with vocalist Xenoyr he mentioned that the band changed drummers at one point (from Dan Presland to Nelson Barnes), then went back to Dan. How was that transition for you, and are there any noticeable differences in their styles? The band was on hiatus for almost 2 years, with [guitarist] Benji’s Visa problems and personal issues in the band, money, and loss of loved ones etc. It was a very tough time for all and Dan is someone who has a huge drive and must keep busy whether it be drumming or working. He lost interest in the band because it seemed we were going nowhere and he decided it would be best to step aside and focus on other things. It was very hard to deal with as we believe he is one of the best metal drummers out there, and there is a big shortage of phenomenal drummers. Our dear friend Nelson put his hand up to try out and claim the throne. He did a fantastic job. He really understands the drum kit. He learned the entire album in a couple of months. However, Australia is a very big place and Nelson had to fly down from Brisbane to Melbourne for every rehearsal and gig. It was just not a viable option, but it was the only option we had and did not want to delay the release of the album as we had already been waiting two years. We toured Australia for the Portal of I album launch and went back to our jobs. We discussed the future of the band, if this is a long term commitment or if it would be best to part ways with Nelson due to the distance between states. NeO need to rehearse weekly to write such intricate music and there was no way we could fly Nelson down weekly, or even fortnightly at best so we approached Dan again. We informed him that the band was back up and running and we have been touring and playing in front of large audiences and his interest was ignited. Dan is now a permanent member of NeO again and we could not be happier as he is family to us and so easy to work with. He is the human metronome. As for Nelson, he is busy with his own band The Schoenberg Automaton and they have just released their debut album Vela. It will put Australia on the map because it is absolutely groundbreaking technical metal. They will be huge! You mentioned earlier that you intended to do a solo project. Can you please elaborate on that, and if you’re involved in any other projects outside Ne Obliviscaris? I am in a few projects. There was a point in time I was in 3 full-time bands at once: Aphotic Dawn, Primordial Space and NeO. Aphotic Dawn is no longer around, they also featured Dan Presland on drums. We supported Morbid Angel and Kataklysm but did not release anything. I stepped aside from Primordial Space to focus more on NeO and my other projects. It was a hard decision because I love that band so much and have been part of it for 6 years. We rehearsed regularly but did not get anywhere – just a handful of gigs, no official releases. The band is still together and features Benji from Neo on lead guitar. As of now NeO is my main focus and always will be. I play in a band called Vipassi with Dan on drums, and Ben from A Million Dead Birds Laughing on guitar. He is an absolute genius, and although the band is moving very slowly, once it hits the live circuit I think people will be quite surprised. It’s definitely the most challenging work I have been involved in. It can be described as a mix of Ulcerate, Deathspell Omega and Gorguts. And lastly, I have been working on a solo death metal project called Infinite Density for the last 4 years. I have 22 songs and have been recording them at home over and over, getting better at producing, but I am a finally at a stage where I am happy with my guitar playing and producing abilities and will release a demo/EP containing 8 tracks this year. So keep an eye out and follow me at www.facebook.com/infinitedensity.